The apartment is perfectly located just a 3 minute walk from a wide sandy beach and pleasure marina at Caleta De Velez with Baviera 18 hole golf course a 5 minute drive away. Right outside the accomodation is a large open air swimming pool open in the Summer months and tennis court for the use of guests only. A medium sized resort, Caleta has a number of cafes,bars and restaurants serving good food (especially fish and seafood) all within walking distance. Local shops and a bank are also nearby. There is a small marina. The balcony has a table and seating for 4 persons; breakfast in the sunshine! The 3rd floor apartment, bright & secure in a 4 floor building with lift and intercom entry, also has private parking for guests. No busy roads to cross for beach access. Sorry, no pets. NEW for Summer 2018, aircon in the bedroom. Local Lifestyle: Caleta De Velez is a versatile holiday location on the beach with the fishing harbour and marina just a few minutes walk. The apartment is perfect for those wishing to walk on holiday as all the local facilities are no more than 5 mins walk away. There is a small supermarket, bakery, newsagents, tobaconists and several bar restaurants within walking distance. And a beautiful walk along the beachside promenade to Torre del Mar - around 15 mins walk. On Saturday morning the street market sells everything from local crafts to fresh fruit and vegetables. 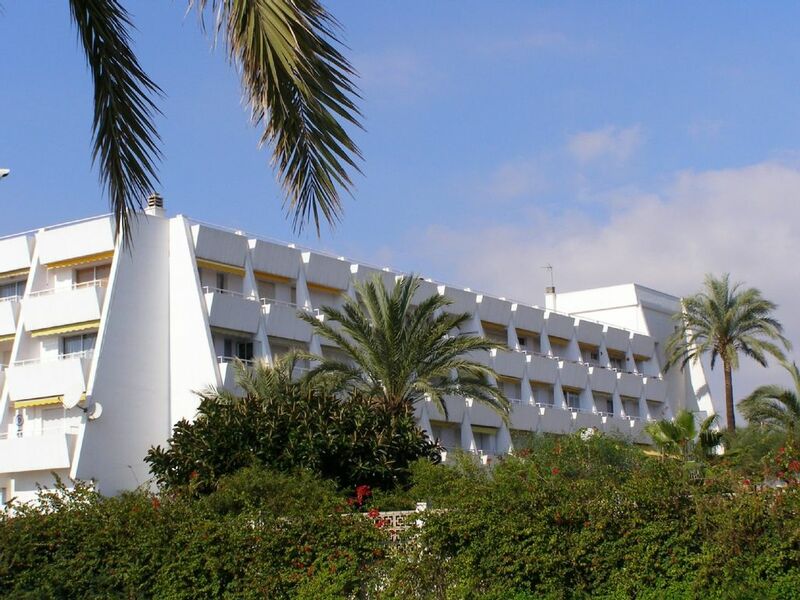 Velez Malaga & Torre del Mar: Torre del Mar is a much larger resort with entertainment for all ages. It is reached by walking approx 15 mins along the beachside walkway or is a 5 min drive. Enjoy beachside bar/restaurants serving fresh fish & seafood. Also Indian, Mexican, Thai, Chinese and of course, Spanish restaurants. There is a good street market on Thursday. Cycle hire, go karting and horse riding is also popular. A waterpark is also open in July/August. Velez Malaga has a large modern shopping centre with boutiques, huge Eroski supermarket, tenpin bowling and multi cinema complex. There is a modern tram service between the shopping centre and Torre del Mar. Or drive by car in 5 mins. Exploring Andalucia: Caleta De Velez is a central coastal base from which to visit the most popular sights of Andalucia. Granada and the Alhambra Palace are a must see day trip, with the Sierra Nevada ski resort a short drive from Granada city centre. Malaga city cente is exciting, cultural and has great shopping and tapas bars! Visit the castle and the Picasso museum. Nerja has great beaches and famous caves - just a short drive. A good motorway network connects Malaga to Antequerra, Cordoba and Seville; for those wanting to travel a little further. Marbella & Pueto Banus, to the West of Malaga, is also a fun day trip. N.B. There is a good and inexpensive bus service operating both East & West from the apartment. Visit both Malaga & Nerja without needing to take the car. close to all amenities. 3 minutes from a Sandy beach and a small but quaint port..Good eateries around. toilet, shower, There is also a and wash basin and a extractor fan/grid. The shower room is fully tiled to a high standard. It has an extractor fan and ample storage. New AIRCON in Bedroom and in Lounge. Bed linen provided. One bottom sheet and a duvet cover, 4 pillowcases. There is private parking right by apartments. 1 Hand and 1 bath towel provided per person. NO beach or pool towels provided. Please bring your own.. The kitchen is American style with a center bar dividing the lounge and the kitchen. 4 hobs, microwave, 1fridge and 1 freezer. Toaster. Kettle. Cupboards. Crockery, kitchen utensils. Water heater. Spanish Televison . Spanish and English channels. There is a small table and 2 chairs on the balcony. Other 2 chairs are in Lounge but can be put outside if needed. Caleta de Velez small marina offers Boat trips. Large Swimming Pool is open from mid June to mid September with lifeguard on duty. We provide you with tickets for the swimming pool, please look after them. thanks. 3rd floor apartment with lift and intercom entry. NEW 2018 THERE IS NOW AIRCON IN BEDROOM AND LOUNGE. Fans provided in summer & radiators in winter. Swimming pool open in summer months Mid June to mid September with lifeguard on duty. Ramp from parking area to lift access - wheelchair friendly. Please ask if you have any specific requirements. We stayed in this lovely one bedroomed apartment for a month and it had everything we needed even dominoes to play in the evening! Easy to walk to nearby restaurants, bars and beach or catch the bus outside and travel up and down the coast visiting the many villages. The apartment is very well equipped and it feels like home. No hesitation in recommending the property and area. Many thanks for letting us stay!! This is the second time my wife and I have been to Carl's apartment in Caleta. It has everything we need and more besides. Nice apartment and great location. Owners were there to welcome us and show where everything was, nice touch. Apartment has everything you would need. Only 2 min walk to the beach , bars and Aldi . Excellent location, perfectly formed apartment, what more could you want. Property had all that we needed for the two of us. Carl met us at the apartment and had excellent local knowledge. Would recommend the apartment and we'll probably stay there again, if we haven't already bought our own place in the sun. Caleta de Velez is both the local fishing port for Velez Malaga and a pleasure marina for motor cruisers and sailboats. The quaint marina is situated 2 kms East of Torre del Mar - a 20 minute walk along the seafront promenade. Nearby are several small bar/restaurants serving a good selection of local dishes, especially local fish & seafood. Local shops, including a newsagent, grocers, tobacconist, a gym and a bank are a short walk. There is an Aldi and Lidl conveniently situated not too far from the apartment. The saturday local market is excellent. Nerja and Torrox are approx 15 minutes drive East. Granada, and the Alhambra Palace, is around 90 minutes by car. The cities of Seville & Cordoba are approx 2 hours inland. As is Marbella and Puerto Banus, to the West of Malaga city - which itself is 40 minutes drive from the apartment. Buses run regularly from Caleta to both Malaga and Nerja. Discounts for bookings of 3 weeks or more. Payments accepted in euros or uk pounds at the relevant exchange rate. Longer lets considered between Nov & March. Please ask for a price. A 25% deposit is requested to confirm a reservation. Full payment details on request. Prices include cleaning after your stay and swimming pool tickets in Summer. Saturday preferred changeover day.